My sassy is so sick right now, she can barely walk!! actually she can't with out my help, my arms are aching. Love that painting! I'd love to have a painting of Hurley...one of my granddogs. Wish I hadn't been absent from the blogs...I missed this contest. Too too adorable!! I miss you girlfriend come and see me! 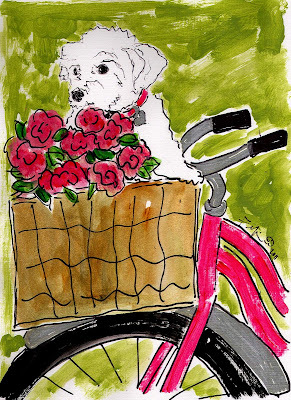 Too cute....Fifi you know how much I adore each and everyone of your Dog Paintings! What an adorable doggy in your painting! Love the pink and everything about this one! Your previous post said that voting was open until August 26th!! Was it supposed to be July 26th?? ?